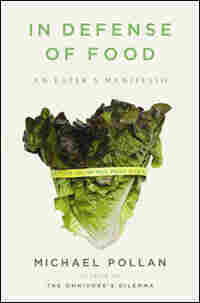 'In Defense of Food' Author Offers Advice For Health In his new book, Michael Pollan advises readers to "Eat food. Not too much. Mostly plants." He says that we should make healthy food more of a priority, even if it means spending more time and money, or get used to chronic disease. 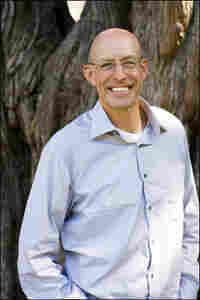 An extended version of Steve Inskeep's interview with In Defense of Food author Michael Pollan. That's the advice journalist and author Michael Pollan offers in his new book, In Defense of Food. "That's it. That is the short answer to the supposedly incredibly complicated and confusing question of what we humans should eat in order to be maximally healthy," Pollan tells Steve Inskeep. The implication of Pollan's advice, however, is that what we're eating now isn't food. "Very often, it isn't," he says. "We are eating a lot of edible food-like substances, which is to say highly processed things that might be called yogurt, might be called cereals, whatever, but in fact are very intricate products of food science that are really imitations of foods." Pollan acknowledges that distinguishing between food and "food products" takes work. His tip: "Don't eat anything that your great-grandmother wouldn't recognize as food." Take, for example, the portable tubes of yogurt known as Go-Gurt, Pollan says. "Imagine your grandmother or your great-grandmother picking up this tube, holding it up to the light, trying to figure out how to administer it to her body — if indeed it is something that goes in your body — and then imagine her reading the ingredients," he says. "Yogurt is a very simple food. It's milk inoculated with a bacterial culture. But Go-Gurt has dozens of ingredients." A large part of the conversation about food — like debating low-fat and low-carb diets — serves as a way of avoiding the idea that maybe we're just eating too much, Pollan says. He says his advice about how to limit consumption is based less on science, which he says "has failed us when it comes to food, by and large," and more on culture. "Cultures have various devices to help people moderate their appetite," he says. "Once upon a time, there was scarcity. We don't have that anymore; we have abundance. But if you go around the world, you find very interesting tricks and devices." One is small portion sizes, Pollan says. "The French manage to eat extravagantly rich food, but they don't get fat, and the reason is that they eat it on small plates, they don't have seconds, they don't snack." In Okinawa, Japan, a cultural principle called "Hara Hachi Bu" instructs people to eat until they are just 80 percent full, Pollan says. "You do know when you are full, and the idea of stopping eating before you reach that moment ... if you do that, you will actually reduce your caloric intake quite a bit," he says. Finally, eating plants is very important, Pollan says. "There is incontrovertible but boring evidence that eating your fruits and vegetables is probably the best thing you can do for preventing cancer, for weight control, for diabetes, for all the different, all the Western diseases that now afflict us," he says. But can you follow Pollan's advice and avoid processed foods without spending a ton of time and money? "You're going to have to spend either more time or more money, and perhaps a little bit of both," Pollan says. "And I think that's just the reality. It's really a question of priorities, and we have, in effect, devalued food. And what I'm arguing is to move it a little closer to the center of our lives, and that we are going to have to put more into it, but that it will be very rewarding if we do. "And if we don't, by the way, we are going to suffer from this — you know, we hear this phrase so many times — this epidemic of chronic disease. But the fact is, we are at a fork in the road. We're either going to get used to chronic disease, and be ... in the age of Lipitor and dialysis centers on every corner in the city, or we're going to change the way we eat. I mean, it's really that simple. Most of the things that are killing us these days — whether it's heart disease, diabetes, obesity, many, many cancers — are directly attributed to the way we're eating." You would not think that common food animals could themselves be rejiggered to fit nutritionist fashion, but in fact some of them could be, and were, in response to the 1977 and 1982 dietary guidelines as animal scientists figured out how to breed leaner pigs and select for leaner beef. With widespread lipophobia taking hold of the human population, countless cattle lost their marbling and lean pork was repositioned as "the new white meat" — tasteless and tough as running shoes, perhaps, but now even a pork chop could compete with chicken as a way for eaters to "reduce saturated fat intake." In the years since then, egg producers figured out a clever way to redeem even the disreputable egg: By feeding flaxseed to hens, they could elevate levels of omega-3 fatty acids in the yolks. A handful of lucky whole foods have recently gotten the "good nutrient" marketing treatment: The antioxidants in the pomegranate (a fruit formerly more trouble to eat than it was worth) now protect against cancer and erectile dysfunction, apparently, and the omega-3 fatty acids in the (formerly just fattening) walnut ward off heart disease. A whole subcategory of nutritional science — funded by industry and, according to one recent analysis,* remarkably reliable in its ability to find a health benefit in whatever food it has been commissioned to study — has sprung up to give a nutritionist sheen (and FDA-approved health claim) to all sorts of foods, including some not ordinarily thought of as healthy. The Mars Corporation recently endowed a chair in chocolate science at the University of California at Davis, where research on the antioxidant properties of cacao is making breakthroughs, so it shouldn't be long before we see chocolate bars bearing FDA-approved health claims. (When we do, nutritionism will surely have entered its baroque phase.) Fortunately for everyone playing this game, scientists can find an antioxidant in just about any plant-based food they choose to study. Yet as a general rule it's a whole lot easier to slap a health claim on a box of sugary cereal than on a raw potato or a carrot, with the perverse result that the most healthful foods in the supermarket sit there quietly in the produce section, silent as stroke victims, while a few aisles over in Cereal the Cocoa Puffs and Lucky Charms are screaming their newfound "whole-grain goodness" to the rafters. Watch out for those health claims. *L. I. Lesser, C. B. Ebbeling, M. Goozner, D. Wypij, and D. S. Ludwig, "Relationship Between Funding Source and Conclusion Among Nutrition-Related Scientific Articles," PLoS Medicine, Vol. 4, No. 1, e5 doi:10.1371/journal. pmed.0040005.